Looking for last year’s meeting minutes? Visit our Members Only page. Alberta Seed Processors are heading up a program aimed to encourage growers to use the best seed possible to target successful crop production. Membership is open to any ag-based co-op within a reasonable distance to Alberta to ensure membership benefits can be delivered. Seed Smart Scholarship: Apply today! 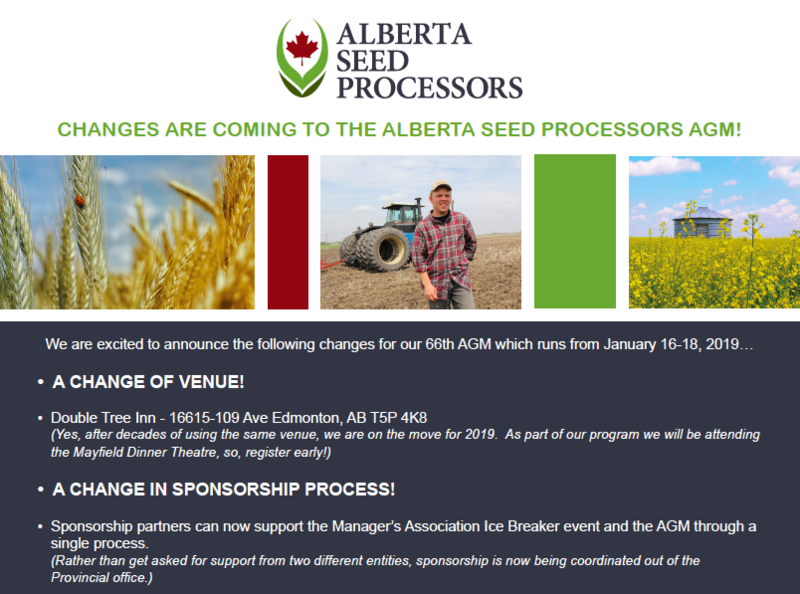 2019 AGM – Changes are coming! To create seed and grain processing opportunities for local and global markets. To strengthen and build upon past accomplishments in seed and grain processing and business diversification focusing on long term business sustainability. Currently membership is open to any agricultural based co-op within a reasonable distance to Alberta to ensure membership benefits can be delivered.